The Geek Culture Forums! : Are you ready? » The Geek Culture Forums! » News, Reviews, Views! » Politics/Religion/Current Affairs » Are you ready? Author Topic: Are you ready? And I am still here. I guess the mormons were right, better go get me some more wives. I particularly liked the bit where the Steve Jackson Illuminati game predicts the future. Oh, and of course Obama is a muslim sleeper-agent and the anti-christ. Well that was a bit anticlimatic, wasn't it Anyone hear trumpets? Or earthquakes, or nuclear explosions? Or anything to suggest the end is nigh? It's been re-scheduled for tomorrow now. I see the site's been updated to now predict that it will be "Fall 2009 - The End?" Typical. They always ignore several Biblical verses when they do this kind of thing, such as Mark 13:32: "No one knows about that day or hour, not even the angels in heaven, nor the Son, but only the Father." Oh well, these kinds of people have been around a long time. The only difference is that now they can build really bad websites. Figures I'd be left behind... and here I was hoping to be the only one left with all the comic books in the world. Just myself, my glasses and my books.... now where did I put those glasses of mine? I used to have super powers until my therapist took them away. 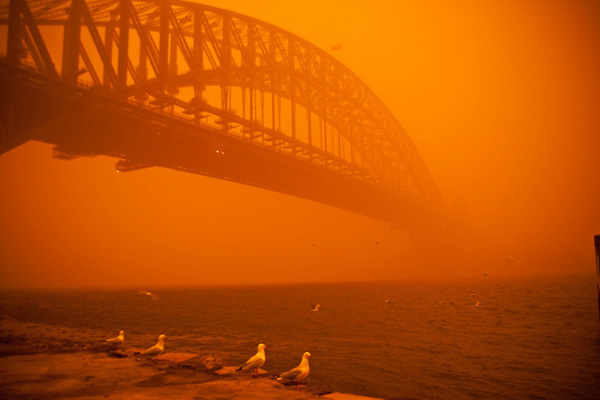 End Of Days, Sydney style. Too bad they didn't bother to fix the rest of the site - we now have seven years of tribulation starting in 2009 and ending in 2015.